This toolbox we found is amazing! We decided not to refinish it, but I couldn't resist the silk-screening. 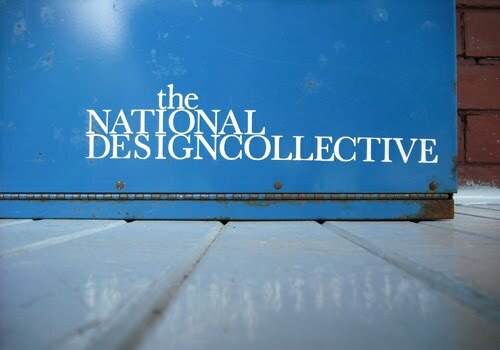 the NDC attended the opening of Bent out of Shape: Canadian Design 1945 - Present that was held at the Design Exchange. It was a treat for us to see 90% of the things we've read in the Design in Canada book all under one roof. Some of the items that we never thought we would see in real life were Hugh Spencer's Project G stereo, and the G2 version. We absolutly fell in love with Bob Forrest's 2001 chair (made in 1970), seeing it in the flesh made the world of difference, the angle, the fabric, and the material that were used, it was magnificient. Apparently only a mere 300 were made! Iconic Canadian designed chairs including (from left to right) Lawrie mcintosh's chair, Stefan siwinski's three0legged dining chair, Waclaw czerwinski and hilary stykolt dining chair, and the dodds stacking chair. Overall, seeing all these great iconic Canadian industrial design products really reinforces how important Canadian design is. 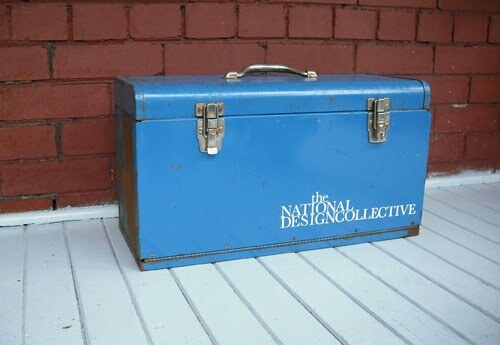 Hopefully the next time a NDC product will be there! The second stage of the competition is to build the birdhouse and submit it for judging. You may recognize the construction from way back here. You can check them all out in person at the Summer Showcase and vote for (ours as) the People's Choice Award at the TBG. They will be auctioned off at the Toronto Botanical Gardens Flocktail Party in September to raise money for the gardens. 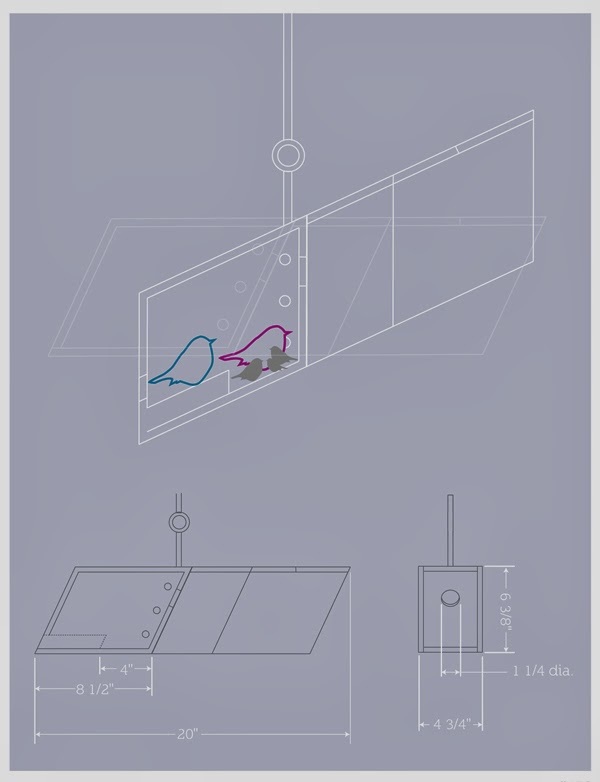 Let your birds live in the utopian birdhouse of the future, today! 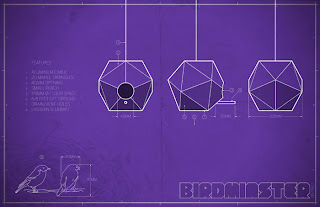 The Birdminster house is intended for the Eastern Bluebird and is based on 1v icosahedron geometry. This allows the house to maximize living volume while minimizing building materials. 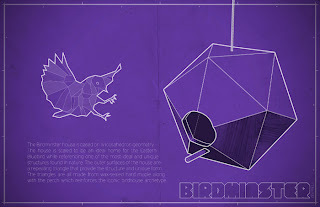 The house is scaled to be an ideal home for the Eastern Bluebird while referencing one of the most ideal and unique structures found in nature. The house features small holes on the bottom for drainage and venting, and a predator resistant cable and opening. The wax-finished maple can be put back into a natural environment to decompose, and the cable is aluminium which is one of the worlds most recycled materials. The geodesic dome has not reached the level of ubiquity that Buckminster Fuller had hoped. 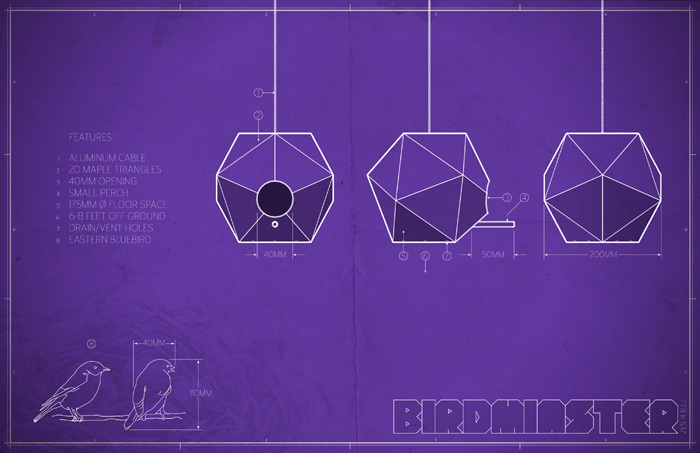 In a playful way, Birdminster aims to raise awareness to the limitless optimism that Buckminster Fuller and this geometry once represented. Birdminster and Home & Away. We recently completed two birdhouses for the 2nd Annual For the Birds Competition, to help raise funds for the Toronto Botanical Garden and raise awareness about the plight of songbirds. You can check them out in person at the Summer Showcase and vote for the People's Choice Award at the TBG. They will be auctioned off at the Toronto Botanical Gardens Flocktail Party in September. Home&Away is a House Wren birdhouse that acts as a signifier to when nesting birds have made their home. Where House Wrens typically return to the same breeding territory year after year, Home&Away’s signal is a welcome visual cue that our little friends have returned. 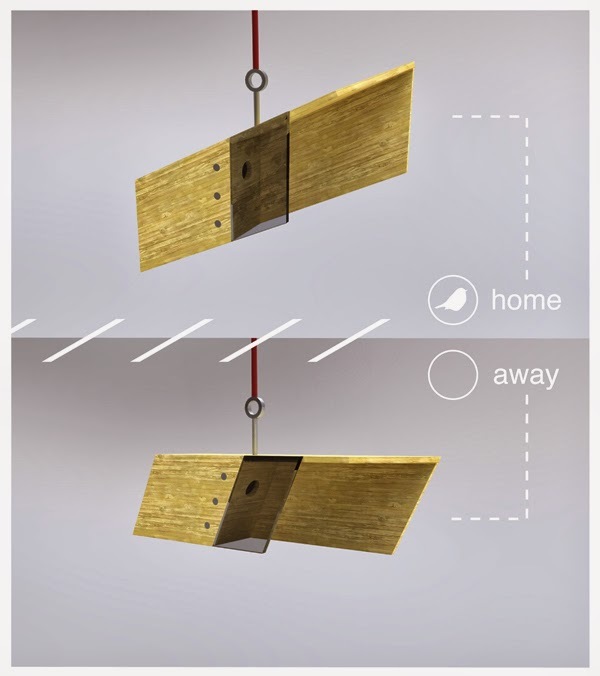 Starting in a neutral position when the home is unoccupied, the birdhouse will tip at the additional weight of the birds and their offspring. At the end of the summer when the birds migrate south, the birdhouse will tip back to neutral position, signaling a successful breeding season. Here's a quick video (definitely not a proper tutorial on the process and also definitely not a fire safety video) on the cedar burning experiment that we conducted a few weekends ago. We thought it would be nice to share the huuuuuge flames that showed up suddenly around the 55s mark, and Scott's panicked face (54s) when he realized that the garden hose was in fact, off, and not on. NDC - Cedar Burning Experiment from Heather Lam on Vimeo. Hey pyros, don't try this at home!!! 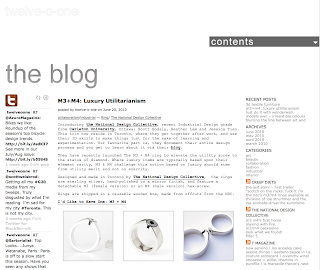 We're happy to announce that our M3/M4 Rings are getting some positive publicity online and in stores. 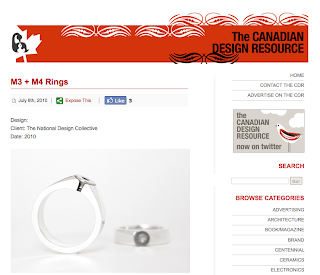 Our rings have been featured in the Canadian Design Resource, twelve-o-one, and creep diets. 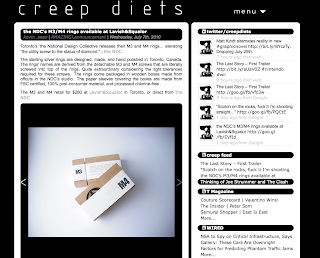 Thank you to all the people who wrote about the NDC & the loyal blog readers.